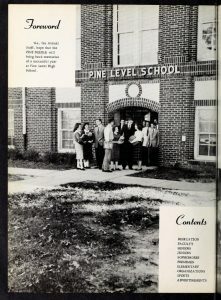 Several yearbooks from various high schools in Johnston County are now online at DigitalNC, provided by our partner, the Johnston County Heritage Center. Included are editions of The Pine Needle from 1952-1965 by Pine Level High School, and editions of The Senoca from 1926, 1961, and 1963 by Selma High School. A view of Pine Level High School in 1960. 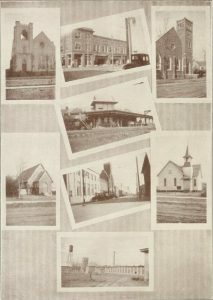 Views of Selma High School and the town of Selma in 1926. These yearbooks contain student portraits, class portraits, and photos of school groups, sports, and activities. Several of The Pine Needle editions also have “Class Prophecies”, where the students imagined where they would be in the future. The 1926 edition of The Senoca also has a history of the town of Selma, North Carolina, and includes some details on the school’s history after its previous building burned down. These yearbooks join other previously digitized yearbooks from these schools. To view more materials from Johnston County Heritage Center, visit their partner page, or take a look at their website.